I had a chance to try out a few of the OpenCTF challenges this year at DEFCON. After OpenCTF was over, I went to a talk given by the ShellPhish team about their Cyber Grand Challenge adventure. In it, they open sourced one part of their tool called angrop. To be clear, they are intent on opening up the rest of their tools, but for now this was the one that was ready to go. Given that there's a brand new ROP tool to play with, and I have OpenCTF challenges to look at, I decided to give it a go and take angrop for a test drive. All the challenges I looked at for this competition were 32-bit. This is likely the authors being nice to players as it allows them to use IDA Pro freeware version to look at the challenge. In this case, however, let's use radare2 as it is a better general purpose tool for the future and you will be able to use it with 64 bit binaries as well. As with the previous intro exploit challenges, it reads in input, then echos it back out. Let's take a look at the main function in r2. This is fairly strait forward. The application creates space for the input, it sets an alarm, sets properies on stdin/stdout, prints some info, calls mprotect, then calls the vulnerable function. One interesting this to note here is that the compiler chose to go with stack pointer based variables (see "esp + local_8h" for example). IDA Pro does not have great support for this type of thing, and actually when you attempt to give them a human readable name it gets all messed up and actually names the location in the code. However, radare2 successfully names these variables with the command "afvsn <old> <new>". One example of where radare2 is actually performing better than IDA Pro. See the call to fgets where we read in at most 2048 (0x800) bytes. The address that it is read into is at ebp-0x88, so we have a massive buffer overflow here. To verify that the overflow works, we'll send an input of 0x88 "A"s, 4 "B"s, and 4 "C"s. In this case, we expect our instruction pointer to be all "C" values and our base pointer to be all "B" values. <snipped> Reading symbols from ./tyro_rop2_8be61a1002b74b6dd6b0838c7384db84...(no debugging symbols found)...done. The program crashes as we expect. Now comes the part where we play with angrop! I will say up front that there are certainly stronger examples than this one of where you would want a rop tool like this, but why not use it here too? The idea of angrop is to give you a pythonic interface to building rop payloads. It integrates tightly into the angr framework, which means that it gives you the ability to do many things with the binary without ever leaving your python shell. It also utilizes a constraint solver to help find solutions for your payload generation. I should mention that there are many other tools that help with rop payloads. 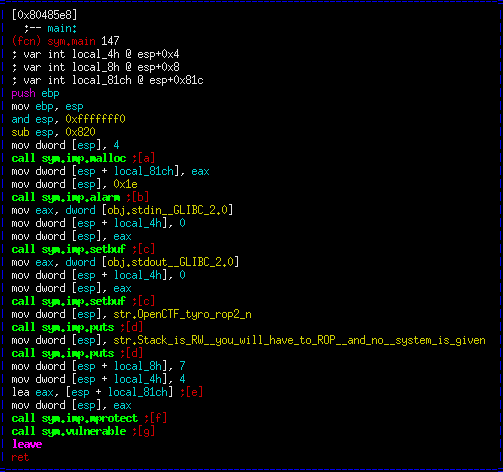 In fact, there's one that is very similar in nature created by Jeff Ball called rop_compiler. I definitely recommend you take a look at that tool as well if you're interested in this subject. Obviously this is a new tool to all of us, but the naming convention is fairly strait forward. It exposes primitives such as writing memory, setting registers, stack pivots, and calling functions. 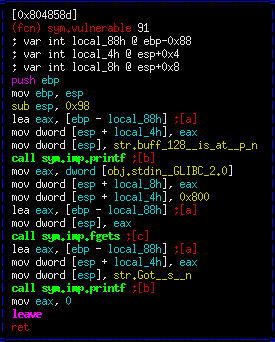 It also appears to be able to create an execve chain, which is a common thing to want to build with a rop payload. Saving your gadgets can similarly be important when you have large binary files that you need to use rop on as discovering the gadgets can be a time consuming process. At this point in my exploitation of this problem I honestly got side-tracked into looking for a legit pop-pop-ret style rop payload. The problem is that this is a very small binary that utilizes shared libraries. This means that, usually, any syscalls will happen outside of the main binary. Also, due to the small size of code to work with, creating a full rop payload is difficult. It dawned on me that, while we no longer have the easy win of just calling the system function, we do have that mprotect call. For those who don't know, mprotect is a function that is used to set memory page permissions, such as read/write/execute. It's at a static offset since this is not a Position Independent Executable. All we should have to do is use mprotect to change the permissions on our buffer to allow execution, then jump to it. Given that we know the location of our buffer, the location of mprotect, and have an easy buffer overflow, we have all the pieces we need. In this case, I used the "func_call" method as I wish to call the mprotect function. I was able to give it just the string name and angrop was able to convert it to the correct address. Further, angrop was able to take the argument list provided (the second argument) and place it in our chain. Finally, we effectively call (technically it's a return) to our buffer. I gave an example buffer address in this case, however this will become a variable soon. Also note that the "p32" calls are actually pwntools functions (the great Gallopsled tool suite). I was a bit rusty on mprotect, but reading up on it I (re)discovered that the memory boundary that we were mprotecting on needed to be at the page boundary. This means that I can't just tell mprotect to change our buffer, I have to offset that to be at the page boundary, and then ask for the page to be changed. The page size on my system is 4096, so I just dropped the memory address down to that boundary and the exploit worked. I've inlined the script below, and posted it on github. Really, the rest of the script (not described) is simply mechanics of using pwntools and python to interact with the binary. As I stated before, I did this one after OpenCTF was completed, so I don't have the flag to give you. Still, it was a nice introduction into angrop. Looking forward to what other fun things we can do with this tool!